This week our Friday Night Date Night took us out on the town to a Wine Dinner Fleming’s in Tysons Corner. The theme of tonight’s Wine Dinner was “Big Reds” and we were excited to try these wines on a cold winter’s night. As it is with most wine dinners we met up with our dear friends Frank and Joy to spend the evening tasting wine, sharing stories, and making new friends. 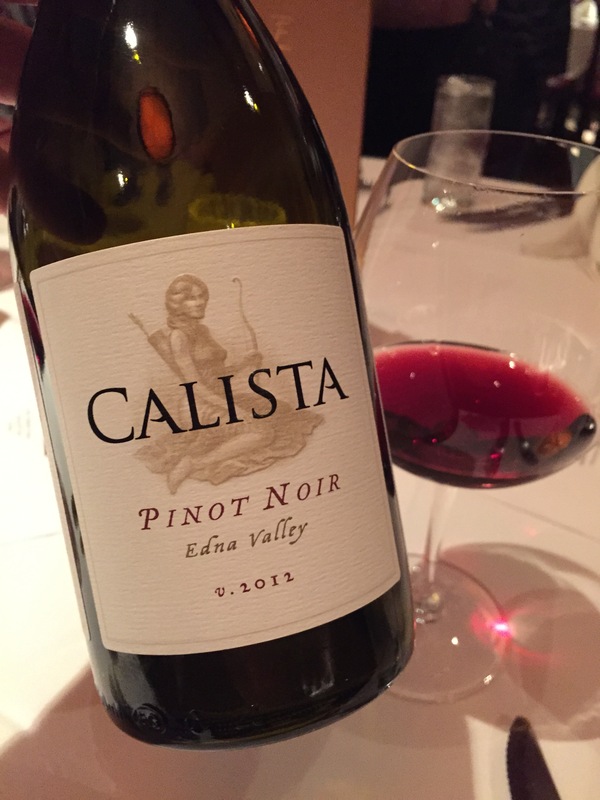 Settling in to the evening we begin our first course and try our first of the “Big Reds”, a nice Pinot from California’s Central Coast a 2012 CALISTA Pinot Noir from Edna Valley. To me this red was not as much “big” as it was a bright and pleasant wine that paired perfectly with the Seared Duck Breast Crostini’s. This Central Coast Pinot was very fruit forward with a light finish. It brought out the sweetness of the Hoisin Sauce and built a bridge to the rich seared duck. This was a very good start to our evening. Along the way we got to know the other couple at our table, Elna and Spence. They were a lovely couple located here in the DC metro area. Spence was a lot of fun and fit in perfectly with the shenanigans Frank and I get in to. Our next course brought us another red in the “Big Reds” collection a 2012 Cabernet Sauvignon from Napa Valley CLOS du VAL. This wine was indeed more full bodied and had a peppery quality to it that paired well with the Lollipop Lamb Chops with pistachio pesto and garlic mashed potatoes. The fresh mint in the Pesto really tied in to this Cabernet which opened up the whole course and gave the wine a licorice quality that was not there without tasting the food. Great combination for sure! The third course in this fantastic wine dinner brought us some really interesting wine and food. I was expecting the “Big Red” theme to crescendo to a Bordeaux but was pleasantly surprised to taste the offering from Walla Walla Valley in Washington State. The 2009 RÔTIE CELLARS, Syrah Northern Blend was a great finish to the evening. This well balanced Syrah had just a touch of Viognier that paired nicely with the Roasted Venison Medallions with chimichurri sauce, gnocchi, and cauliflower. This wine drank like a Bordeaux with lots of berry and cocoa qualities. The venison was cooked perfectly and the berry from the wine helped with the gaminess of the meat. The service at Fleming’s is fantastic and very well organized. From start to finish the timing was perfect and we never had an empty glass. I am very impressed with the wine program at this chain restaurant. Great job!